ETS Heating Systems put efficient heating at your command. They draw energy during off-peak hours while electricity is in lower demand, and, therefore, less expensive. That energy is then transferred into heat, which is stored within high-density bricks inside the unit. Hyper-efficient insulation prevents unintentional heat loss, limits static discharge and maintains low surface temperatures. An adjustable thermostat gives you full control over this 100% efficient heat around the clock. 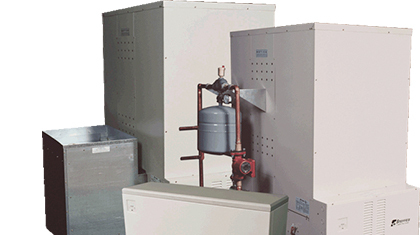 With no tank-filling or annual tune-ups, ETS Heating Systems are virtually maintenance-free. And an easy-to-read digital display contributes to simple operation. ETS Heating Systems use two types of highly heat-resistant insulation. One is a tightly woven layer of spun aluminum silicate. The other is made from materials identical to those used to cover space shuttles. Together, they create a standard for efficiency and safety. Built-in controls monitor and regulate internal and discharge temperatures and there are no emissions or combustible elements. Even so, be sure to follow recommended clearance parameters for your system. All units are covered by a five-year, limited warranty on parts. Bricks made of special materials are designed for optimal heat storage. Electric heating elements use off-peak energy to create the heat stored by the bricks. Space-age insulation around the core helps the bricks retain stored heat. 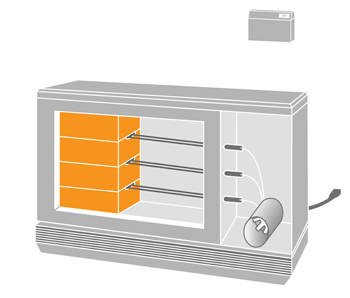 Fans move air around the heated bricks, which is returned to the room. An adjustable thermostat puts you in control of your desired comfort level. It may be built in to the unit itself, or on a wall in your home.